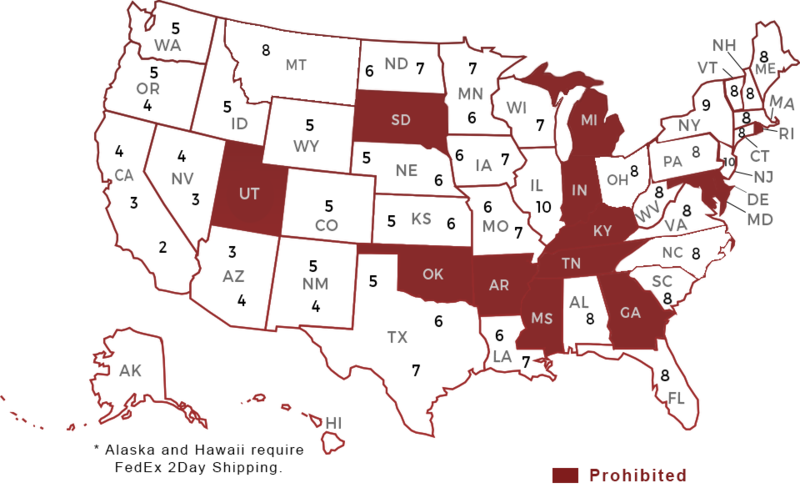 States with zones are either currently licensed for shipments or are in the process of being licensed. We are currently unable to ship to Canada. Extreme Wine Deals offers the lowest shipping rates in the industry. We process and ship orders Monday through Friday, excluding normally observed holidays. If you place an order on Saturday, Sunday, or a normally observed holiday, your order will be processed the next business day thereafter. All Alaska and Hawaii shipments are shipped FedEx 2Day. Please call for current shipping rates. We are committed to having every package arrive in pristine condition and when expected. To accommodate all expedited shipping requests, we offer the following services and time tables. All Priority Orders arrive Monday - Friday Only. Our cutoff time for Express Overnight and 2nd Day Service is 12:00 PST. All orders placed after 12:00 PM PST will be shipped the following business day. Normal Express and 2nd Day service does not deliver on Saturday unless Saturday delivery is requested. Please see additional Saturday Delivery fee below. Saturday delivery service is available for Express Overnight or 2nd Day shipments only. An additional charge of $15.00 will apply for all Saturday Deliveries. Must call for special Saturday Delivery order processing. Alabama state law requires that any wine shipped into Alabama for personal use must be shipped to an Alabama ABC Retail Store. Click here to find a store near you. All Massachusetts orders are shipped once per month from our warehouse to our partnered MA retailer. It will take three (3) to five (5) weeks to arrive. Due to the wine shipping laws of the states within Zones 9 & 10, all wine orders are shipped via a refrigerated truck from our warehouse in Monrovia, CA, directly to a partnered retail store. These packages are then given to Federal Express Ground or UPS Ground for delivery. It will take two (2) to three (3) weeks to arrive. All orders are fulfilled by licensed entities. All wines are sold in California and title passes to the buyer in California. We make no representations to the legal rights of anyone to ship or import alcoholic beverages into any state outside of California. The buyer is solely responsible for the shipment of wines. By placing an order with us, you authorize Extreme Wine Deals to act on your behalf in processing an order, including engaging a common carrier to deliver it. Wines may be sold and delivered only to persons who are at least 21 years of age, and in placing your order you represent to us that you are at least 21 years old. When your wines are delivered, the person receiving delivery will be required to show identification proving that he or she is at least 21 years of age. All offers are void where prohibited by law and void to everyone under 21 years old. Due to state alcohol regulations, items, in some instances, may not be given away for "free". Although an offer may be positioned that you are receiving a free gift and incentive, you are in fact receiving the wine and gift at an overall discounted price. Extreme Wine Deals guarantees all its products and services. Extreme Wine Deals will gladly refund, replace or credit orders that do not meet your expectation. Extreme Wine Deals is not responsible for refunding shipping if an order is cancelled after it leaves our dock.